The Advanced Land Observing Satellite-4 (ALOS-4) is a satellite to observe the Earth's surface using its onboard phased array type L-band synthetic aperture radar (PALSAR-3). The L-band radar technology has continuously been developed in Japan. With further improved observation performance compared to the predecessor PALSAR-2 aboard the DAICHI-2 (ALOS-2), JAXA and its prime contractor, Mitsubishi Electric Corporation, are developing the satellite aiming at achieving both high resolution and a broader observation swath. Unlike observations by an optical sensor, radar images can be acquired day and night as it does not require sunlight. Moreover, since radio waves can penetrate cloud, the images can be obtained regardless of weather condition. The ALOS-4 will leverage these merits for observing and monitoring disaster-hit areas, forests, and sea ice. In addition, it will also challenge new areas such as monitoring infrastructure displacement. The ALOS-4 will be equipped with the Automatic Identification System for ships (AIS) receiver, as was DAICHI-2, so that the satellite will also monitor oceans by receiving AIS signals from vessels as well as by acquiring the PALSAR-3 images. The SPace based AIS Experiment (SPAISE3) is a high performance satellite AIS. Effective countermeasures against radio wave interference regions are taken for the SPAISE3 with multiple antennas and groundbased data processing; therefore, the detection success rate of a ship in the heavy marine traffic areas will be improved compared to DAICHI-2. 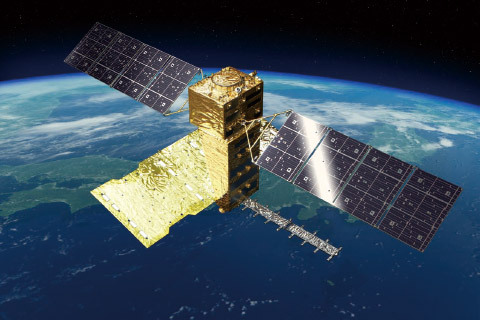 SPAISE3 development is JAXA's ongoing project in cooperation with NEC Corporation. A radar satellite can measure diastrophism or ground transformation caused by volcanic activity or an earthquake up to a few centimeters by comparing acquired data in the same area at different times. For example, the location of a magma reservoir and its movement from surface displacement can be estimated by continuously monitoring volcanoes, and such an estimation can contribute to understanding volcanic activities. Data to be acquired by ALOS-4 will also be used for comparison with data acquired by DAICHI-2, which flies on the same orbit, to investigate changes. If DAICHI-2 tries to cover all active volcanoes in Japan, it can observe one volcano just four times a year, hence more frequent observations would be performed only if a certain volcanic activity gets more active. 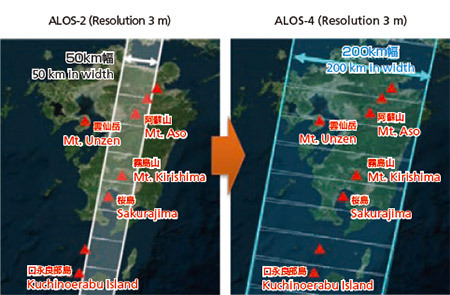 ALOS-4 will increase the observation frequency to once every two weeks so that disaster prevention agencies can find abnormal changes such as unusual volcanic activity, land subsidence, or landslides at an early stage to timely warn people nearby. In addition, the observation swath will be drastically increased from 50 km to 200 km while keeping the high resolution, as you can see in Figure 1. Therefore, we can observe a broader area at the same time when a large-scale disaster that damages wide areas occurs, such as a huge earthquake or multiple eruptions at the same time. Forest covers 30 percent of the all land area in the world, and deforestation is strongly related to the increase of greenhouse gases. Therefore, forest conservation and assessment are important. JAXA and the Japan International Cooperation Agency (JICA) are cooperatively developing the JICA-JAXA Forest Early Warning System in the Tropics (JJ-FAST). Using observation data by DAICHI-2, the JJ-FAST can detect areas of deforestation in the order of a few hectares in 77 countries. However, there are many smaller deforestation areas, hence we receive requests for more detailed and frequent observations. 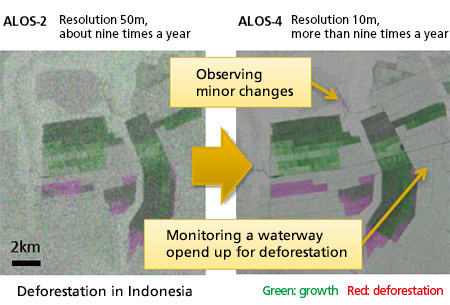 The ALOS-4 will conduct observations more frequently with five times more precision to detect smaller deforestation areas that cannot be monitored by DAICHI-2. JAXA carries out research to detect the annual displacement of structure due to the deterioration of dams, levees, port facilities and other infrastructure by analyzing time series DAICHI’ s data. ALOS-4 will acquire data more frequently, thus we can detect annual displacement that grows slowly and gradually, such as structural distortion and subsidence, with precision of a few millimeters. Through such detailed observations, the satellite data is expected to be utilized for more efficient infrastructure maintenance.